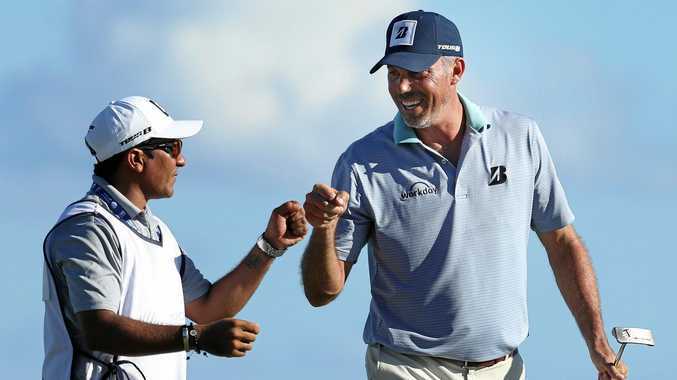 MATT Kuchar has sunk eight birdies in a second-round 64 to take a two-stroke lead over fellow American Cameron Champ at the Mayakoba Classic in Mexico. Kuchar, who went into the day tied for the lead with compatriots Kramer Hickok and Dominic Bozzelli, hit a seven under 64 at the El Camaleon after his bogey-free opening round on Thursday (local time). The seven-time PGA Tour winner's most impressive shot of the day came on the par-four 12th, where he sank a 5.8m putt to limit the damage to a bogey, his only one of the day. Kuchar, who will be one of the star attractions at the Australian Open in Sydney next week and the World Cup in Melbourne the week after, is out to end more than four years without a PGA Tour victory. Champ was sensational on Friday in just his third career PGA Tour start, mixing eight birdies and an eagle with one bogey for a round of nine-under par 62 that gave him the outright lead before Kuchar overtook him later in the day. The big-hitting 23-year-old - coming off his first PGA Tour win, at last month's Sanderson Farms Championship - said he was feeling more comfortable on the course, which allowed him to get into a groove on Friday. "I forgot what par was, to be honest," he said. "I was just flowing, I just kind of felt in the zone, really. I was just trying to execute each shot at a time." The tournament will go into the weekend with slightly less drawing power after three-time major champion Jordan Spieth's failure to make the cut after rounds of 71 and 69. Seven players are at 11 under, including defending champion Patton Kizzire, past Mayakoba champion Brian Gay and Anirban Lahiri of India, who's played in the past two Presidents Cups, and New Zealand's Danny Lee. Eighteen players are within five shots of the lead. Rickie Fowler (68) and Tony Finau (65) are at eight under, along with their Ryder Cup captain, Jim Furyk, who had a 65. Australia's Cameron Davis is at six under and Matt Jones is at four under after hitting a two-over 73.